This buyer’s guide will help inform you about the options present in modern stoves through our gas range reviews, comparison and features sections. You’ll be able to determine which features are important to you and make an educated decision about choosing the best gas range for your kitchen. In the following gas range reviews, we will cover the main features of each product and highlight a few areas that you should be aware of before purchasing. In our opinion, the Samsung NX58H9500WS may be the best slide-in gas range on the market right now. On top of all these benefits, this range is a real beauty to look at. You don’t need to worry about ugly side panels, since this is a slide-in gas range. 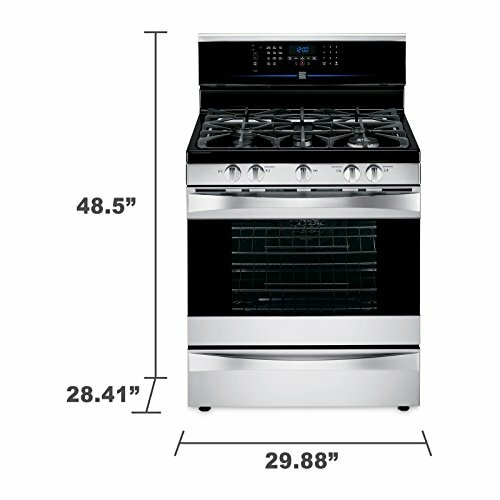 These features are what helped put this unit in our top-rated gas ranges category. A unique feature of the Samsung NX58H9500WS is that it has a temperature probe for the oven to control. This means that you can stick the probe in a piece of meat and have the oven automatically cook it to the perfect internal temperature. A large LCD display helps with control options, so you know exactly what’s happening while you cook. The oven also comes with a warming drawer as well as self-cleaning mode to help keep your oven spotless. The cooktop comes with removable grates to offer continuous grating (for sliding pans around), a special wok grate, and a central griddle section. There are two minor things to take note of. The control knobs on this unit are plastic and can break with regular use. The high heat on the burners isn’t the easiest to control – you’ll need a gentle touch to simmer with the powerful burners. 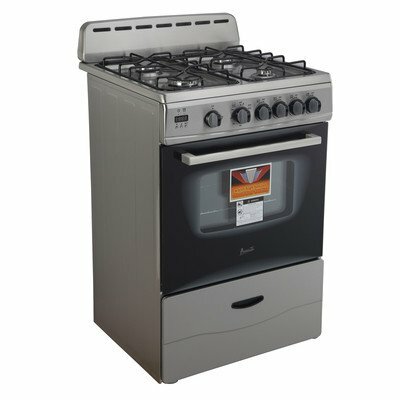 The price point of this range is quite reasonable, considering the features and heat output. When browsing the other best gas ranges, keep the Samsung NX58H9500WS in mind or see our full Samsung nx58h9500ws review for more details. We recently updated our LDG3036ST review because that model has been discontinued. 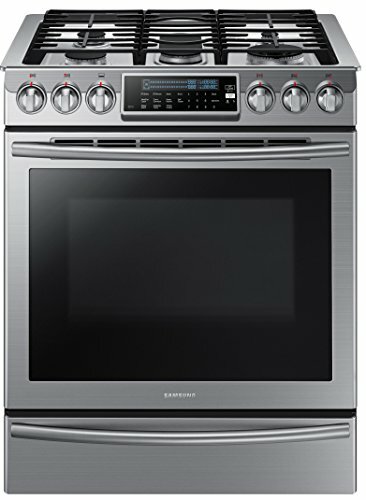 However, the 30″ LG LDG4315ST is what we call an updated model that also includes a double oven with convection. LG is a well-respected kitchen appliance brand, so let’s have a closer look at this range. LG’s offering comes with two ovens for complex baking and energy savings on small tasks. Its Superboil™ burner tops out at 18,500 BTU for high heat cooking. Unlike the Samsung, where a small handful of the control knobs seem okay until they break, the knobs on the previous LG model felt a bit cheap. They’re made of flimsy plastic which could be prone to breaking or even melting. They are very touch sensitive and may be accidentally turned on with a gentle bump. However, our investigation suggests that the flimsy knobs have been fixed and replaced with sturdy ones – be sure to check the packaging and understand what you’re getting. Some retailers are still selling older versions. The central burner is rather underpowered. This isn’t a real issue, because you still have four other burners to use. But we feel that is might have been better to leave it out to save on complexity and cost. It seems like we aren’t giving this gas range much praise, but we do like them. The cons pointed out are pretty much the biggest areas of concern that we could find. This unit is freestanding, so it looks nice even if it’s not in between cupboards, and it doesn’t overhang your counter top. 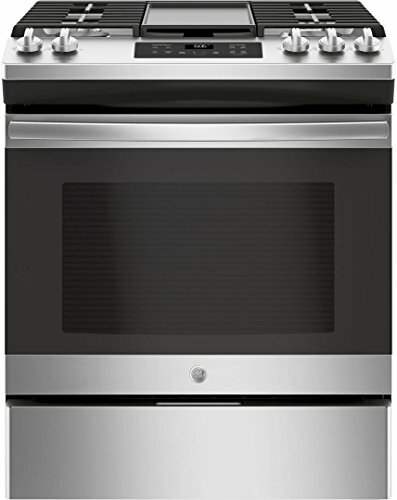 If you’re not on a tight budget, give the LG LDG4315ST consideration when you decide to buy a new gas range. If you can’t afford to pay for a high- end gas range, the FGGF3058RB might be one of the few budget-friendly gas ranges worth considering. Don’t worry, with a 17,000 BTU quick-boil burner and a 14,000 BTU backup, there’s no lack of heat! Surprisingly, this range comes with a temperature probe for programming your oven use. The bottom oven rack extends automatically as you open the door, and a convection fan helps make sure that everything you bake comes out at an even temperature. Purchasing a warranty with this range is likely to be cheaper than repair options, especially considering that circuit problems might not manifest for three years or more. While some problems can be fixed by unplugging your stove and plugging it back in, others may require you to purchase a control board replacement in order to fix the problem. It’s freestanding, meaning it’s not as much of an eyesore without a cupboard covering up each side. Unlike some other freestanding units, the oven controls are in front of the burners, which can be a problem the way this unit ventilates heat. While the oven is in use, the stovetop and burner control knobs may get extremely hot. If you have kids in the house or you’re worried about accidentally burning yourself, you might want to look for a range with better heat ventilation. The HRG3080U is a simple appliance without any fancy electronic controls. It’s a freestanding range with a convection fan for the oven. There are on/off switches for the convection fan and oven light, a temperature knob for the oven, and gas controls for the range. That’s it. It doesn’t have a warming drawer, clock, timer, center burner, or even a self-cleaning mode. Like its competitors, this Thor Kitchen range pushes 18,000 BTU from its big burner and 12,000 from the little ones. This is enough to boil water or preheat a cast iron skillet in no time at all. For home cooking, you probably wouldn’t need to go past medium heat very often. The convection fan cycles air in the oven compartment to distribute heat and make sure your food cooks evenly. While other models tie this functionality to electronic cooking modes, this model simply has an on/off switch. This gives you the freedom to use the fan while you’re still preheating or after you’ve turned the oven off – a feature you don’t find very often. See our full Thor range review for an in-depth look at its features and specifications. Perhaps the biggest downside is the lack of notification when the oven is preheated. There’s a little light that comes on, on the front. You’ll probably wind up setting a timer somewhere and coming back to check the oven when it goes off. This isn’t a big concern, but it’s an additional step that you don’t have to worry about with some ranges. It’s refreshing to see a range like this. After being bombarded by technology all day, it’s nice to have a simple tool that does what it’s supposed to do. Less electronics means fewer parts to repair or replace in the event of a mishap. If you can overlook the lack of a self-cleaning mode, the Thor Kitchen gas range might be worthy of consideration. 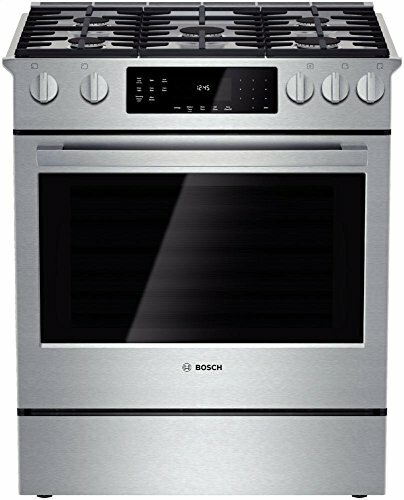 This Bosch model has all the features you’d expect in a modern slide-in range. It boasts a powerful 18,000 BTU burner and center burner, with an optional griddle accessory (sold separately). Opening the warming drawer is a bit harder than it needs to be. It’s designed to pop out with a simple push to release the catch. In practice, you may need to give it a little tug. Not a huge concern, but not exactly what’s advertised either. See our Bosch HGI8054UC 800 review for more information. The oven and warming drawer are incredibly easy to clean. Both the drawer and oven door are removable, giving you easy access to the whole interior. The self-cleaning mode helps; the oven itself burns down any food waste to ash that you can easily wipe off. The electronic oven controls might take some getting used to. There are a few quirks. For example, the convection fan only comes on after the oven is fully preheated. Still, push-button temperature control is perfect for precise baking and the inclusion of a Sabbath-friendly mode makes this an extremely attractive oven for some families. Overall, the quality, flexibility and power of this range make it an attractive option. If you want easy cleaning and modern electronic controls without sacrificing heat output, give the Bosch HGI8054UC 800 consideration. This Kucht range is extremely comparable to the Thor Kitchen model above. 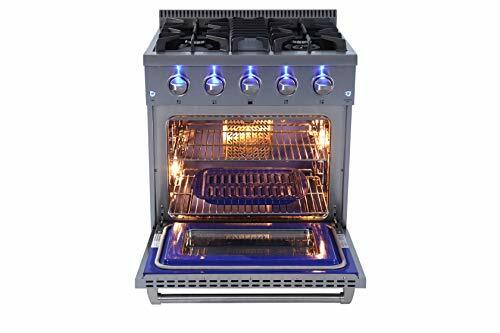 It’s got a similar set of powerful burners on top, the same oven specifications, and the same lack of fancy electronic features. The control knobs are identical. In fact, with the branding covered up, it’s difficult to tell the ranges apart from the front. The insulation on the oven itself leaves something to be desired. The knobs on the front of the range can get hot to the touch when the oven is in use. 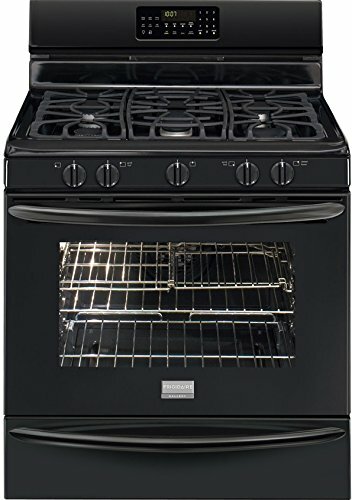 This isn’t a particularly unique problem, lots of ranges get hot when you use the oven, but it’s not a great sign when it comes to durability or build quality. 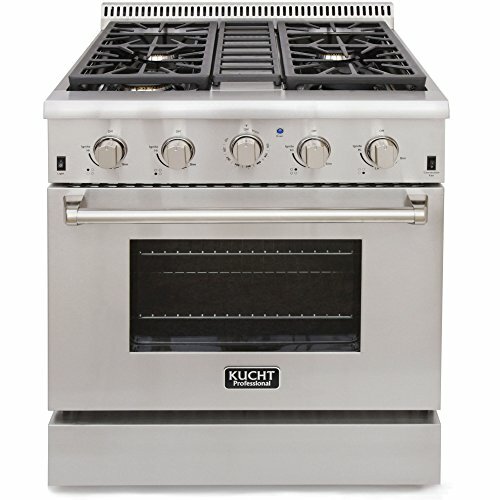 Like the Thor Kitchen model, there’s no self-cleaning mode or electronic oven control on the Kucht gas range. The pre-heat notification is similarly wimpy as mentioned in our Kutch range review. This prevents the lack of oven insulation from being a real issue (there’s no electronics to damage). Again, analog controls give you increased freedom and control while requiring you to set a few more timers. Whether this is an upside or a downside depends on your kitchen and cooking style. If you aren’t tech savvy, consider professional installation. It takes out all the guess work and ensures a safe installation. Kucht has a support number if you need a hand, and from what we’ve heard, their customer service is excellent. With a dedicated LP model available, this range is a strong contender for households that don’t want to fiddle with a conversion kit. Otherwise, it’s pretty similar to the Thor Kitchen model. If you want a powerful range with no frills, keep the Kucht KRG3080U in mind. This Kenmore model makes an attractive upgrade to any kitchen, with its shiny, stainless steel body. While most ovens require you to self-install or hire a technician, Kenmore include an unboxing and hookup service as part of delivery – they will also take away your old oven – one less thing to worry about. The oven has a 5.0 cubic foot capacity, so is sizeable enough to handle a large turkey or similar. As with most models, there is a convection fan, and it’s also self-cleaning. On the large cooktop there are 5 burners, including a handy 5,000 simmer burner and a larger 10,000 BTU oval burner to accommodate griddles. Don’t have the patience to stand around waiting for water to boil? Not to worry, this model has a Turbo Boil burner that puts out 18,200 BTU – that will speed things up considerably. We also found that the flames produced by all burners are steady and very strong. 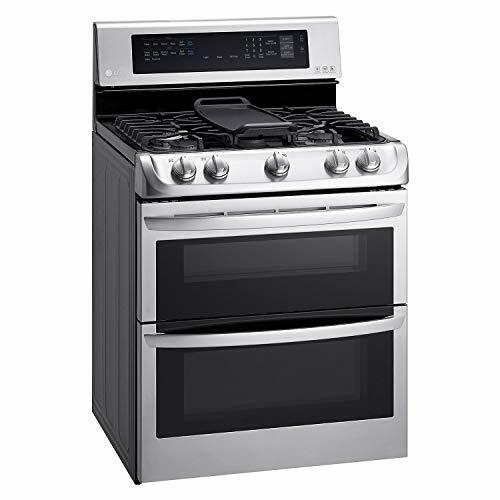 There’s no cheap parts on this attractive range; the grates are sturdy with a nice heft, and even the knobs on front are made from steel and shouldn’t break easily, unlike some of the other ovens featured. We are hard-pressed to find any problems with this stylish model – right down to the digital display which is easy to read and understand, this free-standing Kenmore would be a great choice. The only consideration is budget – you can find cheaper items with similar specs, but you may be sacrificing some quality. Perfect for apartments or cramped kitchens, this free standing 24-inch range won’t take up too much space, but still does a bang-up job. It can be challenging to find an affordable oven in this size range, but the Avanti GR2416CSS seems to fill a great niche – it has all the basics you need at a manageable price, without sacrificing on quality. The glass door to the 2.6 cubic foot capacity oven is a great touch – you can easily monitor your baking without losing half the heat opening the door to check on it. The light can be switched on or off as desired and there is a timer that goes up to 62 minutes. As for the cooktop, 4 sealed burners give plenty of space, even if you are using larger pans. There’s even a storage drawer at the base of the unit. We like that the broiler is at waist height and has a recessed handle for safety – they’ve also included a broiler pan. However, it’s hard to find the perfect product in any category, and this Avanti gas range does have some niggles with temperature control. You may find this model struggles to reach the temperature levels you are after, or has difficulty maintaining the heat. At other times the unit tends to overheat, even at the lowest settings. Be prepared for a bit of experimentation and maybe some frustration as you figure out the quirks of this range. All in all, we feel this product is a great buy for the price. It’s a solid and quality build, with some handy features and looks good. If you can handle some inconsistencies in temperature from time to time, don’t shy away from the compact Avanti GR2416CSS range. As opposed to the Avanti above, the GE slide-in range is full sized, with a 5.6 cubic foot capacity. In keeping with the more generous specs, it has an extra-large nonstick griddle and 5 burners. 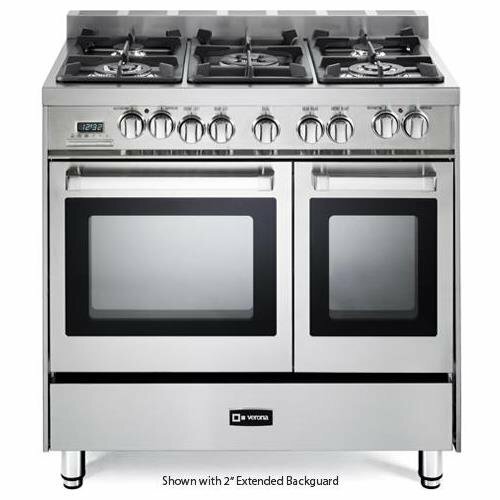 The burners include a simmer burner – perfect for soups, stews and sauces – an oval burner, and two power boil burners. As opposed to many other models, the grate is one continuous piece. There are also the standard features of steam self-cleaning and a storage drawer – which glides open easily, might we add. One oversight that we think could be improved is the positioning of the knobs. Lying to the front of the stove near the burners, they tend to get very hot when the cooktop is in operation – at times you’ll need a potholder to operate them. Overall, another quality offering from GE, with all the standard features. It’s an unassumingly attractive model that will serve you well, with no major niggles. This Verona Pro-Style range looks like it belongs in a professional kitchen, with a sleek, corrosion-resistant stainless steel body and all the bells and whistles you’d expect – storage drawer, digital clock and timer. But does it deliver? Featuring 5 sealed burners and 2 separate convection ovens, you can cook enough for a small army, or if you find yourself cooking for one, save some power by using the compact oven. The main oven has 2.4 cubic feet capacity, while the smaller only 1.5 cubic feet. Some cooks may get frustrated at the restricted size of the ovens. The main oven won’t be able to fit larger things like a full turkey, and the smaller one can’t handle a full-size cookie sheet. The space on the cooktop also feels a bit cramped. The burners are too close together and it’s hard to squeeze two full-sized pans next to each other. Although the gas burners work well, we find that the ovens tend to cook a bit unevenly. We also struggle with setting the right temperature. The knobs are marked at 40-degree intervals, making it tricky to be precise with your temperatures – you’ll need to learn this oven’s quirks by trial and error. Our last issue is that although it looks attractive out of the box, the stainless steel can mark and scratch easily – so you’ll need to be a bit finicky when cleaning and make sure you use non-scratch cleaners and materials. In summary, we feel this dual-fuel range Verona doesn’t quite live up to expectations. It definitely doesn’t come at a bargain price, and when you invest this much you’d expect a much more impressive performance. It does work well and looks great, but only suits the needs of a very specific cook who has a use for two smaller ovens such as this rather than one larger oven. One of the easiest things to quantify about your range is the amount of heat the burners put out. Burner heat is measured in British Thermal Units (BTU). Most cooktops have at least one large burner for high heat (often about 12,000 BTU) and one that’s deliberately on the low end for precise, low temperature cooking (usually around 5,000 BTU). A 12,000 BTU burner on high heat will be hot enough if you occasionally cook with a wok. Appliance manufacturers have innovated range design quite a lot in the last few years. Modern ranges often come with a lattice structure that covers the entire top of the range, enabling you to slide pots and pans from one burner to another without having to lift them over gaps. Others may come with a central fifth burner or even an integrated griddle between the outer burners. Gas ranges vary in size from 30″ to over 42″ for some industrial models. Be sure to measure your kitchen before you purchase anything. Most appliance manufacturers have a range of options available for common sizes. Freestanding gas ranges have solid sides and oven controls are usually located behind the cooktop. Slide-in Gas Ranges often have lips on either side of the cooktop designed to slightly overlap the counter on either side, and oven controls sometimes on the front with the burner controls. Before purchasing a range, please make sure that you know which type of gas the hookups in your home provide and verify that the unit you’re looking at is compatible. Most modern gas ranges come with conversion kits to allow you to use them with either natural gas or propane. The oven attached to your cooktop can come with a number of modern amenities designed to make your job easier. Several ranges offer a convection fan in the oven to circulate air and help foods cook more evenly. Some ranges even come with two separate oven bays to really allow you to multitask. Having an additional oven can be a godsend for complex baking tasks (especially around holidays!). I can’t imagine most home chefs actually use this feature more than once or twice a year, and the two ovens can feel a bit cramped when compared to a single large one. Surprisingly, many of the best gas stoves come without any sort of modern concessions. While LCD displays and complex cooking routines come standard on a number of less expensive models, at least one high-end manufacturer sells units with only the most basic controls. Available features include automatic pizza cooking, precise preheating, and cook timers that automatically shut off your oven. Before you go nuts over these offerings, consider how many of the buttons on your microwave you actually use. Not all the best gas ranges are created equal. Some ranges have control knobs that melt, circuit boards that cook or even faulty gas hook-ups that can cause totally uneven cooking. The warranty options for gas ranges are NOT something you should dismiss out of hand — a few hundred dollars at the time of purchase can save you thousands over the next several years in repairs and replacements. Be sure to assess risk levels for the ranges you’re considering and purchase a warranty or repair plan appropriate for the level of risk your purchase entails. Alternately, purchase a range that’s reliable and durable — even if a cheaper range plus a warranty is more affordable, it might not be worth the hassle of having to call someone out to repair. Modern ranges are pretty safe. Two major concerns you might have are accidental ignition and child-safe controls. Some gas ranges have knobs you can activate accidentally with a gentle bump. If you have small children (or are just worried about not noticing you turned on a burner) you may want to buy a model with electronic child locks for the controls. With the features and reviews highlighted in this guide, you should now be able to reflect on your cooking needs and select the best gas range for your kitchen and budget. If you’re like us, the BTU output of the burners will be especially important, since cooking on the stove-top is my main kitchen chore. If you are a casual baker, the oven options may not be so important to you. However, if you love to bake – and bake a lot at the same time – you might instead want two separate ovens, programmable controls, or a convection fan for even heat distribution while you bake. Whatever features you prefer, make extra certain that you measure the space for your range and get your gas hook-ups checked by a professional. While it might seem incredibly basic and intuitive, you wouldn’t believe how many people try to return appliances that simply don’t fit in their home.